The goal of #BxlFF is to allow fellow food bloggers in and around Belgium to finally meet up with each other, share experiences, network, find recipe/food swap & restaurant buddies… but more importantly – meet the person behind that interesting twitter/blog persona! word lover, light chaser, chocolate addict. Iris writes and photographs stories on her favourite subject: food. In 2010 she found her passion in food photography and started a food blog together with her sister. The blog was noticed by a publishing house and they made two cookbooks together. She now has her own blog ‘Swonderful‘ where she writes about travel, food and photography. 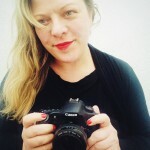 Iris also blogs for Jamie Oliver Magazine NL and works as a freelance photographer and writer for food and lifestyle websites. She is hooked on Instagram and Pinterest. For sponsorship opportunities, please contact us directly. Tickets will not be sold on the day but can be purchased online now!